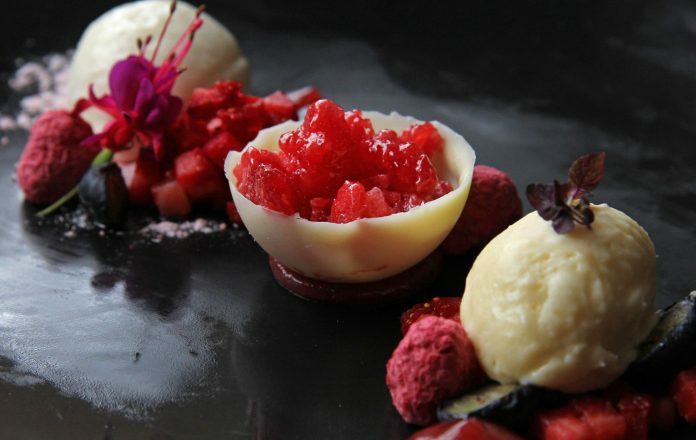 One of the dishes on the sake masterclass menu: Strawberries and Koji Cream: white chocolate and miso mousse, koji ice-cream and strawberry wine granite. Albury-san, prepare to have a few sake myths busted. For starters, the Japanese rice wine is brewed not fermented and some styles are chilled, not served warm. Another common sake misconception is that it comes with a rocket-fuel alcohol content (the Border Cafe team had to wash our mouths out with wasabi for that one). In fact, there is a sake label doing the rounds with an alcohol percentage of around eight per cent. 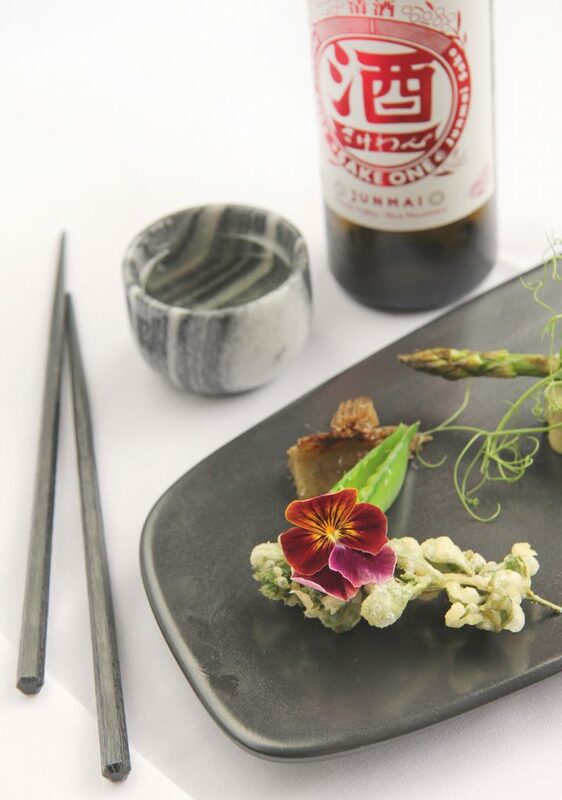 Hassun – Natives and Sea: tempura salt bush and native artichoke from Bunyip Hollow (Wodonga), oyster ‘blossom sushi’ and sweet pea and asparagus tofu. 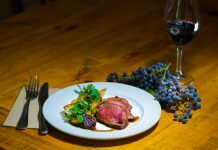 Bringing you this higher education in sake is Border Wine Room, the upmarket Dean Street restaurant with no printed menus. It has invited Melbourne’s sake master, Andre Bishop, to host Albury’s first sake masterclass. Bishop, one of only a few dozen qualified sake masters in the world, will partner with Border Wine Room head chef, Gary Brogdale, for an informative night of all things sake and top-notch cuisine. Just like grape-stomped wine, rice-based sake is developed in differing styles and character. Sake master, Andre, and chef, Gary, will present six Japanese-inspired omakase (selected by the chef) dishes accompanied by professionally-selected matching sake. When we visited Border Wine Room for a staff preview, we were lucky enough to catch a glimpse of the exclusive sake masterclass menu, served up by sous chef, Susan Radoicic. 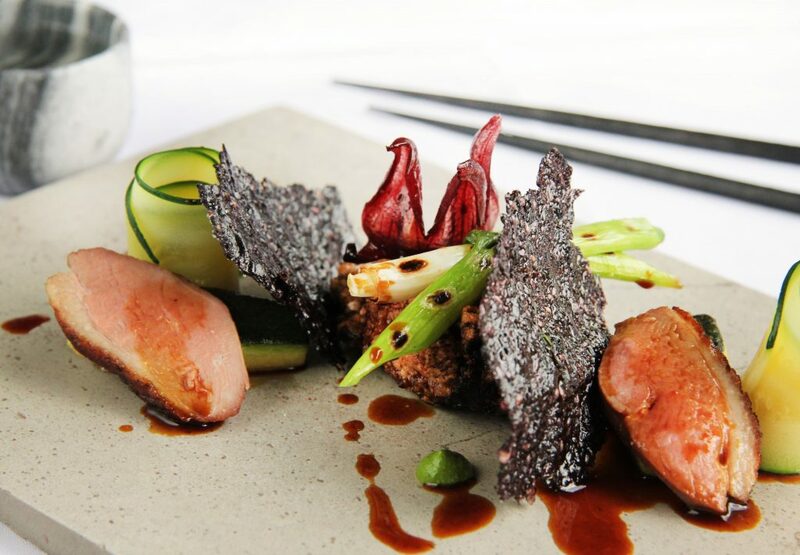 Duck Two Ways: karaage and thyme cured breast, sesame crisp and hibiscus. 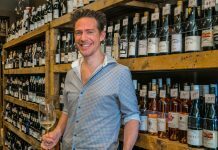 Border Wine Room owner, Kate Murray, says that sake naturally compliments ‘punchy’ fine-dining Japanese flavours, with sweeter sake varieties going ‘hand-in-hand’ with sweeter dishes. “But to say something is sweet in the sake world is not like saying it is moscato,” she says. The good news is that once you’ve entered the Sake Appreciation Society, you will always find it on the wine list at Border Wine Room. 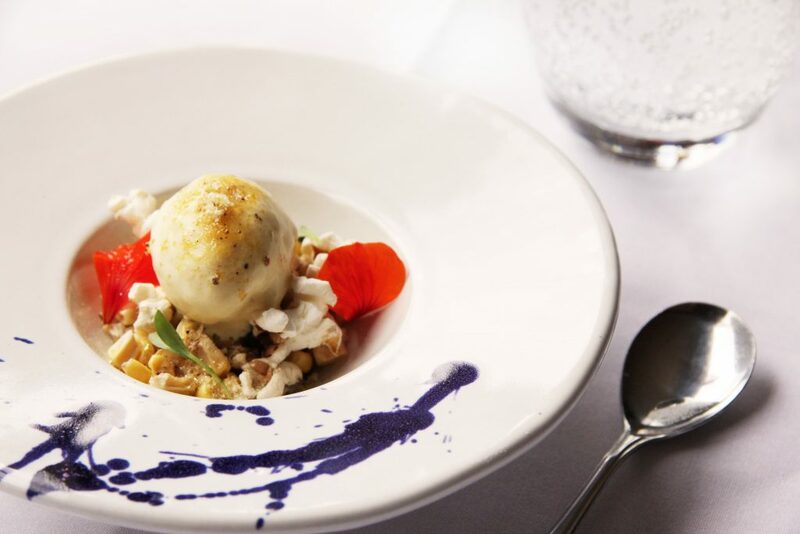 Umami (savoury taste): sweet corn ice-cream, fermented corn and black pepper praline. 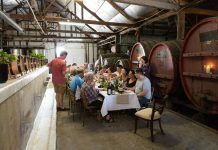 If you want to continue with a tipple at home, Australia’s has its own locally-produced label, Go-Shu (and by local we mean a few hours up the Hume Highway, in Penrith). Staff at an Albury-Wodonga bottle shop were completely honest, sake hasn’t been a big seller to date. They say demand tends to peak at Chinese New Year, which isn’t as odd as it sounds. The history of sake actually begins in China – a fun fact that sake master, Andre, is sure to pass on at his masterclass. 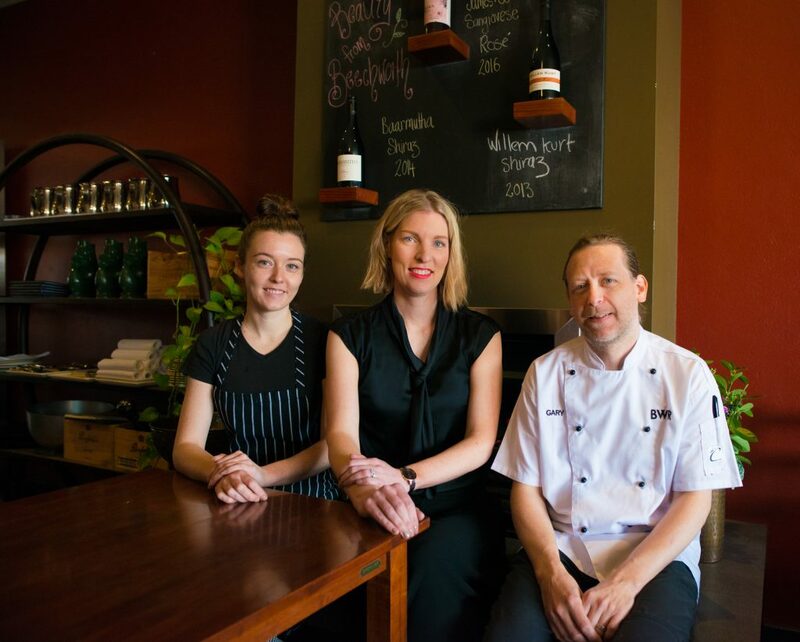 Sous chef Susan Radoicic, Owner Manager Kate Murray and Head Chef Gary Brogdale. Details: Sake Masterclass, Border Wine Room, Saturday 25th November 2017, 6.45pm arrival for a 7.00pm sitting. $180pp (required on booking).